Rachel Weisz and Olivia Colman are both nominated. Yorgos Lathimos’ ‘The Favourite’ has received five Golden Globe® nominations across four leading categories including Best Motion Picture Musical or Comedy, Best Screenplay and a Best Actress nomination for Olivia Colman in a Motion Picture, Musical or Comedy and Best Supporting Actress nominations for both Emma Stone and Rachel Weisz. Other Irish nominations include actor Caitriona Balfe who secured her fourth Golden Globe® nomination for Best Actress in a TV Series Drama for her performance in Starz’ ‘Outlander’. Element has previously received Golden Globe® nominations for previous productions including ‘The Guard’, ‘Room’ and ‘The Lobster’. 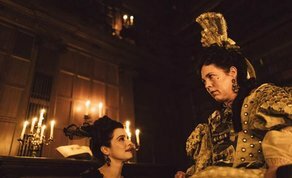 ‘The Favourite’ has been a critical and festival hit since it premiered on the Lido in Venice in August where it scooped the Grand Jury Prize and Olivia Colman won Best Actress. Last weekend the film dominated the BIFA’s (British Independent Film Awards) with a record-breaking 10 awards on the night. It is currently performing strongly at the US box office where it had the highest per screen average on its opening weekend since ‘La La Land’, two years ago. These nominations come on the back of rave reviews from US press including The New York Times (‘wildly entertaining’), USA Today (‘an abundantly entertaining gem’), The Los Angeles Times (‘a devious delight’), The Wall Street Journal (‘sizzling hot’) and Rolling Stone (‘a bawdy, brilliant triumph’). ‘The Favourite’ stars Olivia Colman and Academy Award winners Rachel Weisz and Emma Stone and marks the third collaboration between Element Pictures and director Yorgos Lanthimos following award-winning films THE LOBSTER and THE KILLING OF A SACRED DEER. The film was shot by Irish cinematographer Robbie Ryan and was partly post produced in Dublin. It will be released in Ireland in January 2019 through Fox Searchlight. ‘The Favourite’ is written by Deborah Davis and Tony McNamara and is produced by Ed Guiney and executive produced by Andrew Lowe for Element Pictures. Other producers include Ceci Dempsey, Lee Magiday and Yorgos Lanthimos. The film is an Element Pictures/Scarlet Films production for Fox Searchlight, Film4 and Waypoint. The 76th annual Golden Globe® awards will take place on, January 6th 2019 .